On 7 July 2017 a “Tunnel Go-through Ceremony” was organized by our Client HZMBA to celebrate the fact that the tunnel link between both artificial islands had become reality. TEC was invited for this event. Managing Director Hans de Wit and Project Manager Ying Li were honoured to be present. Many were impressed by the tour through the almost 6 km long immersed tunnel, currently the world longest immersed road tunnel. 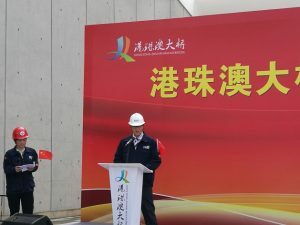 TEC was invited to give a short speech at this ceremony in which the position of the Hong Kong- Zhuhai- Macau Bridge tunnel in the international tunnel market was discussed. You find the text of the speech below. For Tunnel Engineering Consultants – TEC, it was a great honour to be selected in 2008 by the Client HZMB Authorities to become the International Consultant of tunnel and islands for this magnificent project. And to be here at this event and getting the opportunity to make a short speech, after all these years of hard working by so many people for the realisation of this project, is considered as an even greater honour, which makes me very proud. TEC was established nearly 30 years ago and from the beginning we were involved in many immersed tunnel projects in the world including the most complicated ones to date such as the Øresund Link between Denmark and Sweden, Busan Geoje Tunnel in South Korea, an immersed tunnel for the Amsterdam Metro under the historic railway station, the 19 km Fehmarnbelt Link between Denmark and Germany and off course last but not least the Hong Kong Zhuhai Macau Bridge Link. I think through our involvement in these projects, I am able to value the contribution of HZMB tunnel in international immersed tunnelling. 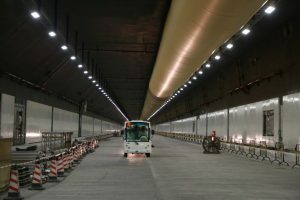 When I look at the design challenges that had to be overcome and the difficult conditions under which the tunnel had to be constructed, both requiring many innovations, I can conclude that HZMB IMT has stretched the technical limits of immersed tunnelling in a way no project has done before. For that reason I believe that HZMB will become a milestone in Immersed Tunnel History. And because of this project, from a relatively small player in Immersed tunnels China developed into one of the front runners in this field in the international tunnel industry. Finally, I would like to sincerely congratulate our Client HZMBA, the DB Contractor CCCC JV, and all other participants in this project with this major achievement realizing this tunnel and thank you for having us playing a part in your project!